Lennard Zinn addressees questions related to health and shifters in this week's FAQ. Have a question for Lennard? Please email us to be included in Technical FAQ. I crashed my mountain bike last May, breaking seven ribs and partially collapsing my right lung. None of my ribs were out of place vertically after having an MRI, so no surgery was required to realign them and I kept exercising the lung. No chest tube or other interventions were required. After a long summer of healing and easing back into riding, I’ve been trying to get back to normal. With the winter months upon us and my ribs feeling good enough after six months of healing to start doing light weight training again, I started back at it, with fairly light weights and low reps, increasing my sets each week. After the third week, the day after I worked out, my right arm felt kind of tight. The day after that, there was a little bit of swelling. I thought maybe I pulled a muscle in my armpit/shoulder area as it was a bit tender. After another day the swelling increased a bit more, so I called the doctor and made an appointment. By the time I went in the next day, even my hand was swollen. I was checked for an infection first and then I was sent for an ultrasound and found out I had a blood clot that was from my chest cavity to my elbow in length! The doctor told me I had what is called Paget-Schroetter disease, or an effort-induced thrombosis. I am now on Eliquis for three months to eliminate this clot. Once it is determined that the clot is gone with another ultrasound, we are going to do a blood flow test. The doctor seems to think that the vein might be slightly constricted where it passes between my ribs (probably from the crash earlier this year). My questions for you are about what light you can shed on cycling while on a blood thinner like Eliquis. My doctor said he’s OK with me riding my road bike but doesn’t want me on my mountain bike right now, as he worries that the jostling of a trail could send a piece of the clot to my lungs. Also, is there anything else I can do to avoid having this happen in the future? And finally a word of advice for readers. If you have something like this happen to you, don’t be a tough guy and think it’s going to get better. While I’m glad I went to the doctor when I did, I shouldn’t have waited a few days. It would have been easier to treat had I gone in sooner, and I got lucky that it wasn’t far worse than it is! I’m sorry to hear about the agony you have been through, and thank you for the advice that hopefully may prevent others from waiting too long to get something like that checked out. As for your question, I am a little bit qualified to answer it, as I have been on two anti-coagulants, Eliquis and Xarelto, in the past. In my case, it all started with a high-speed crash in cyclocross onto frozen grass that created a massive hematoma (no skin wound, as I was wearing knee warmers) on the front of my knee that then traveled down my leg. My prepatellar bursa was inflamed and kept filling with fluid (water on the knee), and my orthopedist drained the fluid many times over a period of months. Ultimately, I developed an antibiotic-resistant staph infection in the bursa that required surgery to clean out. After the surgery, I was in a compression stocking and an additional Ace bandage over that to keep the bursa from refilling with fluid. But when the Ace bandage was removed a few days later, clots too numerous to count that had formed in my lower leg below the Ace bandage traveled to my lungs (bilateral pulmonary embolisms blocking arteries). I couldn’t breathe when I went to bed that night and had excruciating pain in my chest. To break up the clots and prevent more from occurring, doctors put me on Eliquis for three months. My insurance would cover Xarelto and not Eliquis, so I switched to that after the first month. The danger with anticoagulants when you lead an active lifestyle like you do is hitting your head and creating internal bleeding in your brain that won’t stop; you have the additional concern of possibly having clots in your chest and arm that could go to your lungs. The older type of anticoagulant, namely Warfarin (Coumadin), can be reversed by taking Vitamin K if you come into the hospital with internal bleeding. But there is no such antidote for Eliquis or Xarelto, which have largely displaced Coumadin by being easier to take, not requiring frequent testing of clotting factors. I have a number of friends in Boulder who are on anticoagulants and who mountain bike while on them, doctor’s orders be damned, even going on weeklong forays in Moab and Fruita. They are on anticoagulants for the rest of their life due to AFib, and I can appreciate why they would continue to ride rocky mountain bike trails; giving up something you love for the rest of your life is hard. I was fortunate that I could look at it as a short-term thing and thus was more willing to give things up that risked a closed-head injury. During those three months on anticoagulants, I wore a helmet when doing side-canyon hikes and while loading and unloading heavy items from wet, slippery rafts in the Gates of Lodore while rafting the Green River. I also gave up on a mountain bike hut trip from Telluride to Moab and on co-leading a road bike tour from Venice to Rome on roads I’m largely unfamiliar with, including many gravel roads, while riding in a group of riders that I’ve not ridden with before. The risks to me outweighed the benefits, but I had the luxury of knowing that I could do those things some other time. You, too, are on a short-term course of anticoagulation. I think you could give up mountain biking for three months; you’ll be able to do plenty of that again in the future, and the risks are high. If you can ride in such a way that you can guarantee that you won’t crash or get bounced around so much that you dislodge a clot, then fine, but that doesn’t sound like the way you like to ride. I know you’ve had to miss a ton of mountain biking through this process. Nonetheless, my recommendation is that you hold off while on Eliquis. If you love going fast on a mountain bike and taking risks, then riding so carefully that you avoid risk will not be very inspiring anyway. Having had pulmonary embolisms, I don’t recommend them to anyone. And you certainly do not want to have a head injury where your body’s ability to minimize the damage is hampered by the anticoagulant. In regards to indexed Campagnolo 10-speed down-tube shifting, I have used the regular Campagnolo 10-speed TT bar-end shifters as bar-cons on a mustache bar, and as regular down-tube shifters on regular down-tube bosses. It is also possible to change the indexing mechanism to 7-, 8-, and 9-speed indexing on the right lever. I can’t remember which spare parts or part I cannibalized for that conversion myself. However, as a fan of Campagnolo and down-tube shifting, I recommend finding a pair of Simplex Retrofriction down-tube levers instead, as I don’t think indexed shifting brings anything to the table when the lever is mounted on a down tube. 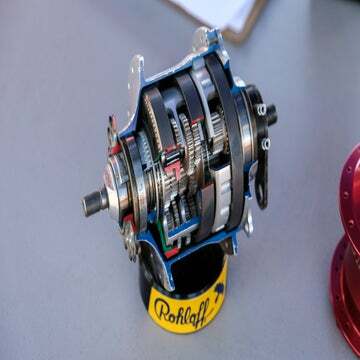 Simplex’s clutched retro spring mechanism offers very fast, very precise, and secure non-indexed shifting when paired with modern chainrings, cassettes, and chains. 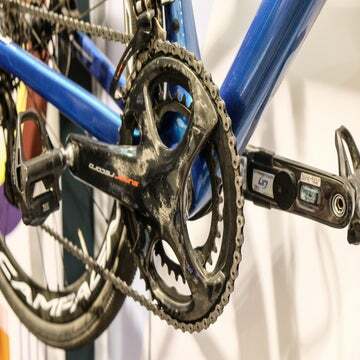 Simplex retrofriction will most likely work with both modern and vintage Campagnolo rear mechs [derailleurs], and it will work with 9-, 10-, 11-, and 12-speed cassettes (same body and same total width of cassette). The Simplex barrel is quite small, but it actually matches a neat 180-degree travel when used with a vintage 1988 Campagnolo Athena rear mech or and a modern Campagnolo Chorus 11-speed rear mech from 2008-2015. 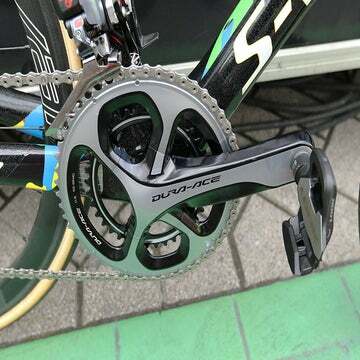 (The shiny Athena 11-speed mech would, of course, be the aesthetically correct choice for a rando-style rear mech, as I assume no carbon is allowed). Oh, did I mention that the Simplex down-tube shifters are just drop-dead gorgeous? Thanks for that nice suggestion. I used to race with those Simplex levers in the early 1980s on Campagnolo Super Record (non-indexed) groups. I loved the feel of their rotation.